Jokes, especially the kind the involve poking fun at SF/fantasy tropes that take themselves too seriously. Unrequited love; romantic banter. Also, and I don’t know how to find evidence to back it up, but Tomlinson’s work, both as writer and editor, always gave the impression that everything was meant, primarily, to be a good solid bit of fun. You can tell he doesn't take himself too seriously, can't you. As an editor, John Tomlinson is indelibly linked with 2000 AD’s difficult period in the early-mid 1990s. As a writer, he’s one of the rare few who managed to epitomise features of both sides of that same difficult period. Tellingly, he’s one of a handful of ‘newer’ droids who got writing work from both the old regime (Burton/McKenzie) and the new (Bishop/Diggle). Apart from anything else, I choose to glean from this that Tomlinson is a decent guy that other people want to work with! 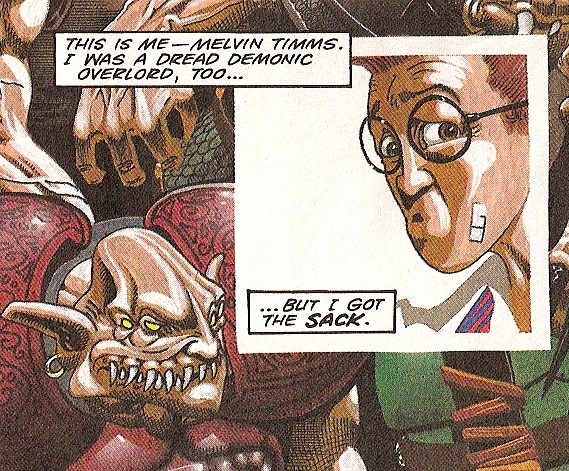 His breakout 2000 AD hit was Armoured Gideon, which felt like something of a bizarre one-off in its first outing, but later morphed into a recurring feature of long-form but also stand-alone series that was most noteworthy for being genuinely funny, in a Terry Pratchett way. Although he’s had a few one-off stories in recent years, his most recent triumph was a stint on Tor Cyan during the Andy Diggle years, a recurring feature of short stories noteworthy for being exceptionally bleak. So that’s showing decent range right there. Parsing editorial credit is notoriously difficult, as all I’ve got to go on are the Prog / Meg issues under his tenure (Progs 828-977, but 915-977 especially). The commissions for the stories that saw print may have happened well before that! Nonetheless, there are perhaps some specifics to pick up on. 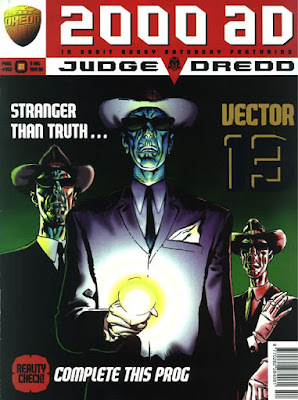 In the overwhelming positive column, there’s the fact that John Wagner was lured back to the Prog as the regular Dredd writer, starting off with a bang on Conspiracy of Silence, featuring hot new art wunderkind Mark Harrison, and leading directly into Wilderlands. As a stand alone story, it’s not the best mega-epic in itself, but the build-up was great, and the whole thing marked something of a turning point for Wagner, who has much more obviously treated Judge Dredd (the series) as one continuous narrative. Sure, it kind of always had been, but somehow the whole Mechanismo/Tenth Planet bit felt like a much more carefully planned attempt to get long term plot threads going. An editorial suggestion? Also positive, the FrIday version of Rogue Trooper got an injection of new blood with writer Steve White and artists Henry Flint and Steve Tappin. Perhaps less wisely, an attempt was made to tie in the new Rogue with the old, but at least Tomlinson had the decency to claim this unholy mess for himself by tying the whole thing off with Tor Cyan, his own contribution to the Genetic Soldier mythos. Strontium Dogs was entering a bit of a mythos mess of its own at the same time, with Peter Hogan taking over from Garth Ennis. The critical consensus is that these stories were just not good. My feeling is that Hogan was being too slow to get to whatever point he was trying to make – he was cut off before we could find out what that may have been. I would say he was at least using the characters respectfully (see also: Hogan’s version of Robo-Hunter). More on this another time. The point stands that Tomlinson was trying to make something of it all, to keep the much-beloved franchise going. While the results weren’t exactly dazzling, I’d also credit Tomlinson with trying some things out to see what might work. Most openly this includes Urban Strike!, a video game tie-in that was an open piss-take of OTT action film clichés, with a lot of excuses for extreme death. It also covers Harlem Heroes: Cyborg Death Trip. Editors polished the script with the same veneer of snarling silliness, doing enough to make it smile-worthy. Urban Strike! : exploitation moive in comics form. Basically, Tomlinson was making the most of what he could with some unpublishable work that 2000 AD was obliged to publish. Further, he was in charge when the 1995 Judge Dredd film came out, meaning he had to a) push Dredd hard (double stories ran for a time there, with Wagner at the front and Mills at the back) and b) refrain from saying anything negative about the film, or even publish especially negative letters. His year-long stint as Megazine editor soon after was a last, hopeful attempt to keep as much new strip as possible, but sadly it didn’t translate to improved sales, (leaving Bishop to step in and essentially turn it into the Wagner Dredd + reprint magazine for a couple of years). Tough times! Again in the experimental vein, the Prog had room for follow-up stories to unclassifiable stuff such as Soul Gun Assassin, The Grudge Father, Canon Fodder and Mambo. I wouldn’t say any of them are lost classics, but I’d also say all of them are exactly the sort of thing that belong in 2000 AD. You don’t need to have read the first series to understand the follow-ups, and in some of these examples the sequels were actually better. All-new series that ran in the Prog when Tomlinson was in charge. What about Tomlinson the writer? 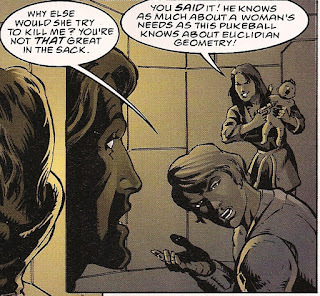 Armoured Gideon is surely going to be the series he’s most remembered for. It’s sort of stuck between being not quite good enough to justify a proper reprint, but maybe a bit too good (and too long) for the Megazine floppies. Another digital bundle, perhaps? In the Grant Morrison / Peter Milligan vein, the series follows a slightly scummy, perennially money-chasing protagonist Frank Weitz, grounded in a very well-defined London. *** Unlike those two writers, Tomlinson sticks to his guns, keeping Weitz front and centre the whole time, and keeping him, for the most part, in the same setting – meaning we get to enjoy a bunch of London references. Of course, the lasting creation from the series is the giant robot, Gideon himself, who benefits from a perfect design by artist Simon Jacob. At first a genuinely frightening villain (well, I thought so), he soon becomes a comic hero, with his one-word vocabulary and relentless pursuit of demons who try to invade the Earth. Tomlinson even gets to play the Alan Grant game of ‘spot the literary reference’, but having Gideon fight against his counterpart Jerubaal – the honorific name given to Biblical hero Gideon from the book of Judges. Jacob’s delightful demons aside, the charm of the series overall comes mostly from the sitcom-esque interplay of the human characters. Weitz banters with his loved/hated editor Benson, and in the background, bored middle-aged suburban nobodies dabble in demonology. Book III tried hardest of all the be crowd-pleasing by plundering 2000 AD’s back catalogue. Apart from getting veteran art droid Mike White to draw an episode, the joke was stretched a bit too thin. Mike White's Frank Weitz. And yes, that's Bill Savage behind him. The banter, but not the demonology, loom large in Tomlinson’s other big series, Mercy Heights. The second Sci-Fi medical drama to appear in 2000 AD****, it arrived with a strong cast of characters, fabulous Kevin Walker designs, and a soap opera style interweaved with two really quite dense plots. That Tomlinson made it work at all in 5-page chunks is impressive. I wonder if it’d have fit better in the Megazine, where it could have used a more sprawling page-count? I suspect the story suffered from wanting to be a proper soap opera, with characters we can get to know and love/hate, but also having to be a 2000 AD action story, meaning characters have to die with a certain regularity, not to mention be exposed as traitors/villains. It made sense that Tor Cyan ended up in a series on his own, but I still miss Kintry, Lila and Administrator Sehetu, to name just a few of the cast. Gray's Anatomy in space. With killing. In the end, Tor Cyan the series proved something of a swan song for Tomlinson. Elevated by art from Kevin Walker trying out his current style for the first time, and then by new find Jock, the series was perhaps the epitome of Andy Diggle’s ‘rocket fuel’ memo. Take an existing idea, pare it to the bone, and throw it onto the page. Somehow, Tomlinson’s combination of plot mechanics, sombre mood and high sarcasm gelled perfectly to make an exciting and thought-provoking little series. If it fell by the wayside, it was because it was sort of Rogue Trooper, but not the REAL Rogue Trooper – who returned immediately afterwards with a full-on Nu-Earth flashback. Tor Cyan: grim n gritty n funny, too. Tomlinson has been back in recent years with a bit of Dredd, and I for one would welcome the chance to see an all-new series from the man. ***The opening episode places Frank Weitz in Brockwell Park, a patch of green just 5 minutes away from the house I grew up in, so I was always going to root for the series! ****The first being Medivac 318. Apropos of these two series, if you like SF hospital stories, I recommend the novels of James White.